I'm very happy to see that a few items I wrote about this week are getting more attention and scrutiny from the press and the public. It's vivid evidence that the internet is a very powerful force in sharing and shaping opinions. First, the NYTimes has another story on the often deadly conditions in the Chinese factories which make electronic products for Apple, Dell, HP, IMB, Nokia and more, following up on stories I mentioned here and here. I am optimistic that all of you using smartphones, computers and gaming consoles don't want to these products being made at the cost of human lives - but first info on industrial conditions has to be reported and widely shared. Another story I wrote I posted on the KnoxViews website about some dangerously stupid comments from TN state senator Stacey Campfield on AIDS and gays has been burning up the internets. I posted the story on KnoxViews since he is Knoxville's senator and Knox voters are the ones who put him in office. Reaction has been swift and widespread - MetroPulse, the KnoxNewsSentinel, the Nashville Scene, the Washington Monthly and many more. A story to keep your eyes on - following the massive opposition to the proposed internet censorship ideas in the failed SOPA legislation in Congress, there is another far sneakier bit of censorship headed towards the U.S. and Europe thanks to a super-secret treaty agreement called ACTA, the Anti-Counterfeiting Trade Agreement which endorses the worst of the SOPA provisions.
" ... unprecedented secret copyright treaty that was negotiated by industry representatives and government trade reps, without any access by elected representatives, independent business, the press, public interest groups, legal scholars, independent economists and so on. Time and again, the world's richest governmental administrations (only rich countries were in the negotiation) told their own parliaments and congresses that they could not see what was in the treaty, nor know the details of the discussion. The European Parliament was one of the bodies that asked its administration to share the treaty discussions with the elected members, only to be turned down. Cables in the Wikileaks dumps showed US officials orchestrating this secrecy because they knew how unpopular this one-sided, heavy-handed copyright treaty would be. The buzz on this treaty is that it may bypass our nation's congressional review if President Obama signs the agreement as an 'executive order'. Bad idea - and hopefully more and more online users will catch this news and oppose it as strongly as they opposed SOPA. After a brief absence, former KnoxNews columnist/blogger/media overlord Michael Silence is back online, highlighting all types of news, information, and bloggers-of-note at No Silence Here. So bookmark his site, get his feed, do what you gotta do to become a regular reader. Tennessee's Gov. Haslam says anti-gay legislation a waste of time. 2-year study of 'red-light' traffic cams show don't decrease accidents - as Mike and I and many others have said, these 'cam-scams' are about making money. In a recent audit, Bluff City, TN is shown to be making more money from these cams than from property taxes. "An eight-hour drive from that glass factory is a complex, known informally as Foxconn City, where the iPhone is assembled. 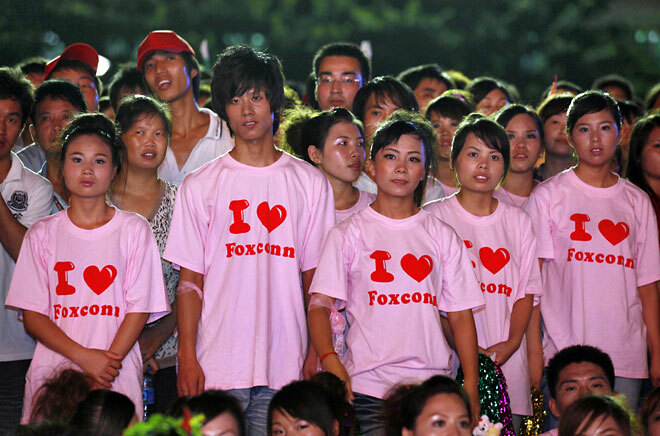 To Apple executives, Foxconn City was further evidence that China could deliver workers — and diligence — that outpaced their American counterparts. The economic engines in China and in Asia are fueled in ways American workers can't or won't work under. It isn't a matter of whether American workers are skilled or not. I mentioned recently the mass suicide attempt by employees at one Foxconn complex in a bid to keep the wages they had. Reports on Foxconn's business model are just barely being provided. But the information is grim. And a global solution which might ignite a boom in the American economy is at best a murky concept. It's as if we are debating what kind of boat to take to sea after we have already leapt over the rails of a ship and are swimming away.